Mac users suddenly have plenty to rejoice about. What happened? 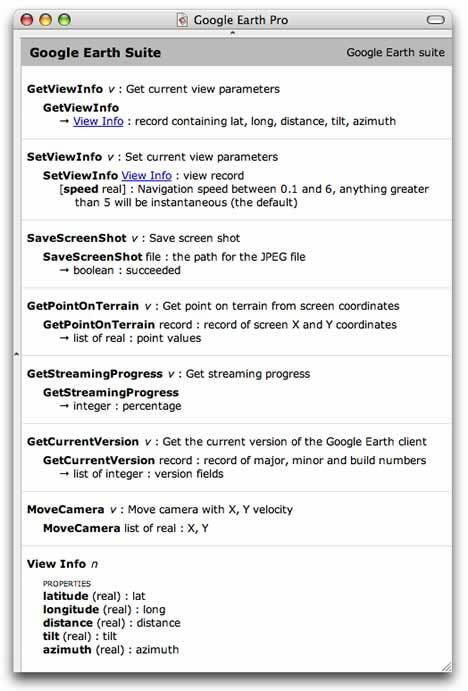 Craig Stanton — he of iPhotoToGoogleEarth fame — just discovered that Google Earth 4 has a basic AppleScript library! This opens up all sorts of possibilities. For Craig, it allowed him to build what is perhaps the simplest, most intuitive georeferencing application on any platform: Geotagger. In your finder, drag the photo to the Geotagger droplet. Done. Geotagger uses AppleScript to read the position of the center of the screen in Google Earth, and adds this to the EXIF metadata of the photo(s) you dropped on it. You can now import these photos into Flickr or Panoramio, where they will be automatically geotagged. If you import these photos into iPhoto, you can use Craig’s iPhotoToGoogleEarth plugin to export them as KML. Only caveat: The photos need to be JPEGs. If you have Salling Clicker, you can download the file containing my (very simple) AppleScript commands for Google Earth. Treat it as a proof of concept; you’ll have to attach the scripts to phone keys yourself. I’m sure AppleScript gurus have ways of turning this into a more polished product. I can’t wait for increased AppleScript support by Google Earth in the future. Imagine geocoding placenames via AppleScript, or taking screenshots of your house as wallpaper for your mobile phone, or letting GPS devices and location-aware mobile phones show you where you are in Google Earth. In fact, some of these things should even be possible with the current AppleScript library. Apple users, your Google Earth API has arrived. The QT video appears as a big ? on my screen. I’m running QT Pro 7.1.3 on OS X 10.4.7 on Intel. It should all work. Well, it’s embedded YouTube code, and I can see it in both Firefox and Safari on my Mac with same specs. Can you see other embedded YouTube content? This is really cool !! Now I wish I had mac book. Pandora’s box indeed: we’ve had our own minor headaches with cross-platform issues between Mac and Windows, and as developers dive into the Windows API and now AppleScript, the experience of missing out on “something cool in Google Earth” because it’s only been tricked out on a particular platform, well, I guess it’s a part of growing up. Personally I think there’s tremendous growth potential in providing an informative, pleasurable, repeatable experience without worrying about what OS, Service Pack, or obscure .dll the end user may or may not have. So while I applaud creativity in extending the usefulness of GE, I feel a faint queasiness when said innovation is limited to a specific platform. p.s. None of the above should be construed as interest in engaging in a Mac vs. Windows vs. Linux debate…. Stefan, you are right, it is the use of YouTube (and therefore Shockwave) that is preventing the movie from showing on my Intel iMac. QuickTime would be fine, but shockwave is not. Brian, YouTube uses Flash (as opposed to Shockwave, which is a Macomedia Director format). The Flash Player 9 is available as Universal Binary. Tell me more about “breathing on the preferences file”. On the AppleScript side of things for Google Earth, if any one who is using Blojsom and ecto as there blogging sulution can us my AppleScript’s for Geo-Blogging for Google Earth & Maps. Click here to download the kmz file of my Geo-Blog. Click here to download the kmz file of The Uni. of Richmond Geo-Blog. Thanks for the Geotagger link. Have you seen JetPhoto? This sets up photo galleries and connects with Google Earth (seems to work fine with Geotagger) and Flickr. this is a really fantastic development! I’m trying to work with the new applescript library, but I can’t seem to specify the “speed” property of the SetViewInfo command correctly… It just snaps to new location instantly. Does anyone on here have any ideas? They would be so so so appreciated! I think you’d better assign keypad for scripts you created to make it easier to navigate in Google Earth using mobile phone. After make that tiny changes, the navigation is much easier. Anyway, thanks so much for your script file.